An illegal movement is a moving violation that could cause potential physical harm to people and/or property. 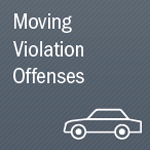 Illegal movements differ from non-moving violations due to the inclusion of the term, “movement.” The most common of these illegal movement are a “failure to” do something, such as failing to signal a turn or failing to stop for a pedestrian in a crosswalk. Your driver’s license can be suspended for several reasons, including accumulating too many points on your driving record, accumulating multiple speeding tickets, getting a DUI/DWI, failing to appear in court, failing to pay court fees, and/or failing to pay child support. Driving on a suspended license is strictly prohibited, and if you are caught you face substantial legal consequences. These consequences can include fines, jail time, community service time, added license suspension time, more points added to your driving record (if state-applicable), mandatory enrollment in a substance abuse program or driver improvement school, revocation or cancellation of your driver’s license, a possible felony charge, and/or stricter DMV scrutiny. In addition, your car insurance premiums will likely increase. A carpool lane violation is defined as driving illegally in a carpool lane, high occupancy vehicle (HOV) lane, diamond lane, or transit lane. In some states, motorcycles and electric cars are permitted to drive in carpool lanes. Some underused carpool/HOV lanes have been converted to High Occupancy Toll (HOT) lanes, offering solo drivers access to these lanes after paying a toll. The consequences of being cited for a carpool lane violation include a traffic ticket, fine, and potential additional points on your driver’s license. A traffic ticket for failure to yield is most frequently issued to a motorist for failing to yield to the right of way of another vehicle, property, or pedestrian. Failure to yield can be directly related to an automobile accident, which is another moving violation that our expert attorneys can assist you with. Other types of failing to yield citations include failure to yield to an emergency vehicle, failure to yield at an uncontrolled or four-way stop, failure to yield at a three-way intersection, failure to yield at a stop sign, and failure to yield at a yield sign. A seat belt ticket, or seat belt infraction, is considered a primary offense in most states, meaning that a police officer can pull you over for the seat belt law violation alone. The consequences of being cited with a seat belt infraction are usually limited to tickets and fines. However, some states have harsher penalties, such as in Arkansas, where failure to wear a seat belt can result in your license being suspended. The most common infraction for failing to stop is for failing to stop at or for running a stop sign and/or red traffic light. Failure to stop for a school bus when children are boarding or exiting as well as failing to stop for a pedestrian are also significant moving violations that can result in both tickets and fines. Contact LegalHelpLawyers.com to speak with an experienced traffic lawyer today!